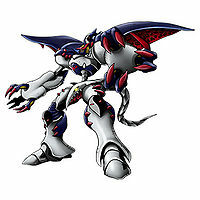 A Demon Lord Digimon said to be Vamdemon's final form. Unlike Venom Vamdemon, which lost its intelligence by seeking too much power and was like a beast, it succeeded in surpassing Venom Vamdemon by harmonizing its intelligence alongside all of its other aspects. It possesses an inhumanly cruel personality, and is willing to do anything to achieve its own desires. The living artillery on both its left and right shoulders, "Sodom" and "Gomorrah" respectively, leech off of it. 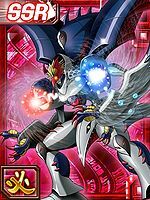 Its Special Move is an extremely high-temperature beam that it fires from its shoulders, Sodom and Gomorrah (Pandemonium Flame). — Digimon Adventure 02: "Terror! 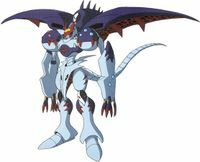 Belial Vamdemon"
A Magic type Digimon that has the parasitic holy cannons Sodom and Gomorrah on its left and right shoulders. Vamdemon's final form, it has great intelligence. It is thought to be one of the Seven Great Demon Lords. Sorry, but Belial Vamdemon's profile hasn't been translated yet. | Belial (בליעל) is the name given to Satan's form that is arisen upon the Earth during Armageddon. | Vam is short for vampire. | De is short for demon. | Myotis is the largest genus of bats. 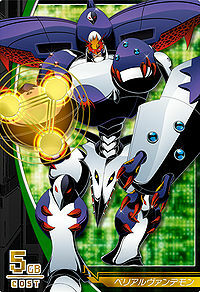 Anime/Manga Digimon Adventure 02: "Terror! 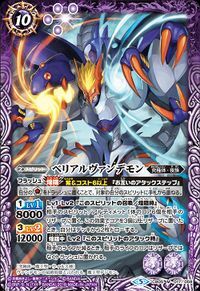 Belial Vamdemon"
Pandemonium Flame  パンデモニウムフレイム Pandemoniumu Fureimu Screaming Darkness, Pandemonium Flame An extremely high-temperature beam that it fires from its shoulders, Sodom and Gomorrah. Melting Blood  メルティング・ブラッド Merutingu Buraddo Crimson Mist, Melting Blood Opens up the jaw-like cannons on his shoulders and spews out a thick, red, acidic mist. Mind Illusion  マインドイリュージョン Maindo Iryūshon Mental Illusion Locks his enemy into a dream of their perfect world. 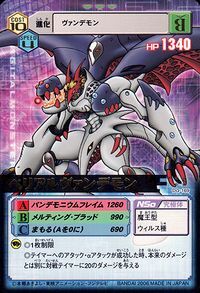 Howling Blood [N 1] ハウリング・ブラッド Hauringu Buraddo Chaos Crusher, Screaming Darkness Produces two spheres of black energy in his hands and thrusts upwards with them, or fires large black spheres from Sodom and Gomorrah. Uses a shield of darkness to absorb energy from projectiles. Emits a thick fog of darkness in the environment which confuses the opponent. 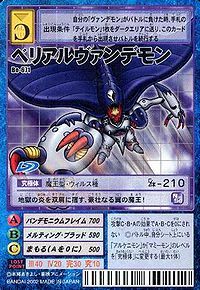 Black Rain  ブラックレイン Burakku Rein Black Rain Leaps into the sky and spins around, releasing a spinning column of small dark orbs from his cape. After Venom Vamdemon is beaten his spirit transfers to Oikawa where he creates the Dark Seed Children and then uses their power to become Belial Vamdemon. He then killed off Archnemon an Mummymon. He uses his Mind Illusion attack to trap the Chosen Children in a world of dreams where they dreamed they were exactly as they wished they were. But Daisuke, who was happy with who he was, wasn't effected and he snapped the others out of it. 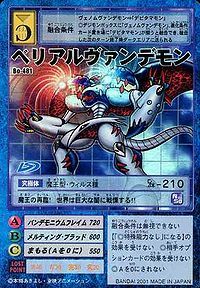 All of the Chosen Children then used the power of dreams to evolve their Digimon into multiple evolutions at once. He was getting beat down until he lead them out of the world of dreams into the Digital World so their Digimon were back to normal. He had the upper hand then but then all of the Chosen Children from around the world showed up and used the light of their Digivices to blind him. He then called on the fear of the Dark Seed children to power himself up but when the group of Chosen Children gave them some pep talk it their fear vanished making the move backfire destroying Belial Vamdemon's body. 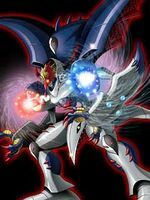 His spirit rose into the air but all of the Chosen Children gave their power to Imperialdramon Fighter Mode who to power his Giga Death attack which finished Vamdemon's spirit off. Belial Vamdemon is the Ultimate evolution of Vamdemon. Belial Vamdemon is an unobtainable boss character. Belial Vamdemon is the third boss character. Belial Vamdemon is a boss character and a secret unlockable. 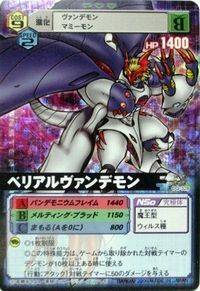 Can be evolved from Vamdemon if above level 45 and need to have a Pico Devimon in your possession. 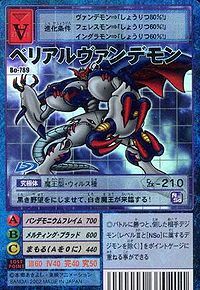 Can be obtained by jogressing Vamdemon and Seadramon / Shadramon if Lv.68+, Spirit 470+, and Archnemon is in Party. 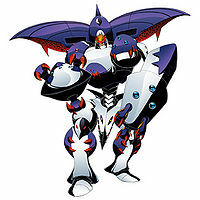 Belial Vamdemon is an available Burst Mode Evolution for Venom Vamdemon. It can be unlocked if level 70 or above with the item Sodom and Gomorrah. 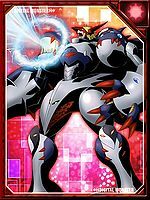 Belial Vamdemon can only be obtained as a collectible card. Belial Vamdemon can only be obtained as a collectible card. 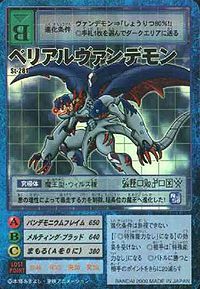 Its card is part of the Lords of the Night (夜の貴公子 Yoru no Kikōshi) set. 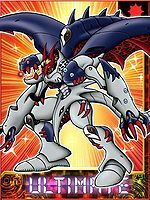 Belial Vamdemon is available as a Digimon Medal. With its knowledge of evil, it keeps its power from running wild. It has evolved to a Demon Lord of the highest level! The second coming of the demon lord! The world trembles in fear of the great darkness!! This winged demon lord puts on an air of grandeur, as it stores the flames of hell in its shoulders! The white demon lord comes oozing its dark ambitions! Vamdemon's final form, it succeeded in surpassing Venom Vamdemon by retaining its intelligence, and lurks in the darkness that resides in the hearts of humans. Mounted on its left and right shoulders are the organic, parasitic cannons, Sodom and Gomorrah. 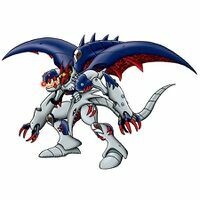 A Demon Lord Digimon said to be Vamdemon's final form. 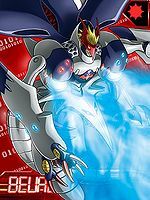 ↑ 4.0 4.1 Digimon Adventure 02: "Terror! Belial Vamdemon"
↑ This attack was listed on BelialVamdemon's Digimon analyzer screen, but it was not announced in the anime. This page was last modified on 21 March 2019, at 20:10.